Today, as I always do on February 25th, I’m posting a little something in celebration of the birthday of my spiritual master, Avatar Meher Baba. Many, if not most, people who’ve followed my work—and certainly this blog—know of my long-time involvement with Meher Baba and his impact not just on my life, but on my writing: most notably, perhaps, my run on Doctor Fate and Seekers Into The Mystery. Because of this I will, from time to time, get inquiries from people asking me about Meher Baba, who He (and, yes, I use the upper case H) is, what His path is and how one goes about stepping onto that path. Today seems like an ideal day to address those questions—in a short, but, I hope, heartfelt and lucid way. Keep in mind that I can only speak for myself—you can line up a dozen followers of Meher Baba and get a dozen different answers to those questions—but it’s been my experience that there is no one particular way where Avatar Meher Baba is concerned. No prescribed rules or rituals. No uniform to wear, mantras to chant, or compulsory meetings to attend. For me, it's all been about an inner connection. Despite the fact that He died in 1969—you can get the broad outline of His life here—I've found Baba to be a vital living presence, a Friend I can always turn to and—via my intuition, the inner voice—get answers from. There are many books—some of them wonderful—written by and about Meher Baba and my shelves are stuffed with them. They’re excellent doorways—and Meher Baba’s words, I believe, hold a unique spiritual charge—but, again, for me this is about inner communication and the words spoken in the heart ultimately transcend the words on the page. Often the Meher Baba I encounter in books (or in other people’s perception of Him) has very little to do with the Baba I encounter inwardly. Not that I haven’t found great value in many of those books; just that, the more time goes by, the more important that heart connection becomes. If Meher Baba is what He said he was—Avatar of the Age, the very embodiment of Divine Love, accessible to all—then we shouldn’t be limited to the words He spoke in the past or the accounts of those who knew Him. He should speak to us clearly and loudly here and now. So if you're interested in Meher Baba, my advice is don't listen to me (or anyone else), talk to Him about it. That’s what it all comes down to: just you and Meher Baba, conversing in your heart. If you get an answer, that's wonderful. And if you don't...well, that's an answer in itself, isn't it? If you live in the U.S., I'd also suggest a trip to the Meher Spiritual Center in Myrtle Beach, South Carolina: a magical 500 acre retreat that is radiant with Meher Baba's presence. And, if you're a world traveler, there’s AMB's extraordinarily powerful Tomb-Shrine in Meherabad, India. These are places where, for many, the Veil between inner and outer, God and man, has been known to dissolve. 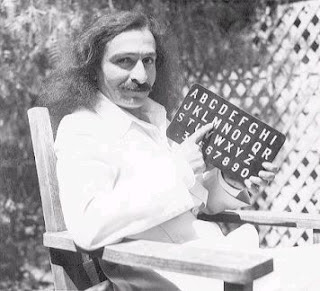 For those of you with questions about my connection to Avatar Meher Baba, there’s the short answer; and for those of you with absolutely no interest in the subject, I hope you didn't mind the detour. Hi JM, Jai Baba and hope all's well. Fitting that today I'm planning an SC Center trip this April once Spring has sprung. Cheers! Hi, Brian. Got back from a Center visit about a week ago: it's just as magical in the silence of the winter. It even snowed. AMBKJ! Ah, I'm so totally jealous. My wife practically grew up at the Center and always told me winter, specifically New Year's, was THE time to be there. Hope while you there you got the renewal you needed...! I absolutely did, Brian. And much more. Hope your Spring trip is magical. I still have a couple of questions, JM. How can I learn the nutshell basics of this way, and what are the most handy books for beginners who wish to understand? I only understand the basics of a handful of faiths (manifestation god, creation, the right path for people, afterlife, clerical), and I have to confess, I find Hinduism the toughest. Actually, Rafa, Meher Baba wasn't a Hindu. He was born Zoroastrian and his followers included Zoroastrians, Hindus, Moslems, Christians, Jews, etc. His path embraced all paths. AVATAR by Jean Adriel. Both are available through Amazon. But, again, the Meher Baba in those books doesn't always reflect the Meher Baba in my heart. It's such a personal thing and, in the end, it all comes down to the individual and Meher Baba, with no one else in the way. I'd recommend looking at some Baba videos on YouTube, opening your heart and seeing what comes back. Maybe nothing, maybe...everything. And each response is an answer in itself.